How much does it cost to travel to Northern Territory? How much money will you need in Northern Territory? AU$153 ($109) is the average daily price for traveling in Northern Territory. The average price of food for one day is AU$42 ($30). The average price of a hotel for a couple is AU$115 ($82). Additional pricing is in the table below. These average travel prices have been collected from other travelers to help you plan your own travel budget. How expensive is Northern Territory? For the chance to see nature at its grandest, put Australia's Northern Territory at the top of your list. The federal territory covering much of central Australia is what most people picture when they imagine an adventure n Australia. It's the real outback. While this state contains some of the most breathtaking flora and fauna, it's also home to a rather posh capital. The city of Darwin is tropical, small and quite diverse. There are at least 50 different nationalities making up Darwin's 110,000 population. With the largest Aboriginal population, this region is perfect for immersing yourself in the 40,000-year-old culture. Visit one of their villages and witness their expert skills at basket weaving, spear fishing and story telling. When making the decision to travel to Australia, keep in mind that their seasons are the opposite of North America. While the climate tends to stay pretty mild all yearlong, don't be surprised to see that they are experiencing their wintertime when we are ready to lay by the pool all day. A trip to the Northern Territory should really begin in the capital city of Darwin. There is so much history in this region, including the Fannie Bay Gaol. As Darwin's major prison for nearly 100 years, this jail certainly has plenty of stories to tell tourists. The Museum and Art Gallery of the Northern Territory is the perfect attraction for a traveler looking to absorb the area's art, history and culture. You'll especially see a large collection of Aboriginal art and material crafts. And, of course, everyone comes to this area to see the exquisite nature. With 52 national parks and reservations, the Northern Territory is a goldmine for people eager to see rare species of wildlife. Set against the most stunning backdrop, animal watching has never felt so exciting. This territory is comprised of four different regions. In the north you have the Top End region, which serves as home to the capital city of Darwin and the Kakadu National Park. The Victoria River Region is a vast area full of adventure, history and nature. The Barkly Tableland is rather sparse but includes Tennant Creek and the Devils Marbles. 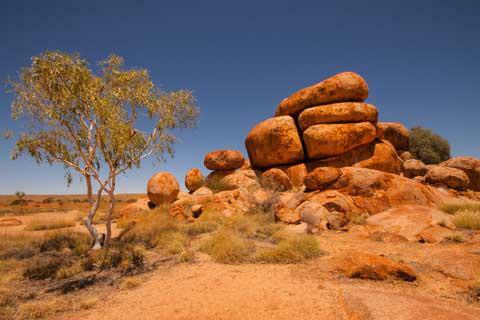 The southernmost region lies in the heart of central Australia. The Red Center is the real outback  home to Alice Springs, Uluru National Park, and other Australian icons. If you can think of an adventure, you can do it in the Northern Territory. This is the perfect place to do that one thing you've always dreamed of. Take a balloon ride over the sunrise on the outback. Swim in the pristine pools of Berry Springs. Explore the rocky red heart of Australia on one of the many bushwalks. Soar overhead the gorges and valleys in a helicopter ride. Canoeing, camping, four-wheel driving, even camel rides are all options  usually available out of Darwin. Whether you want simply stroll and search for wallabies, or take your adrenaline to the max, it's possible in the Northern Territory. Naturally, many of the Northern Territory's eateries can be found outdoors. It's always recommended to try the local flavors, but in particular you don't want to miss Cullen Bay's seafood selections or the pub grub in Fannie Bay. If you are planning on braving some camping and hiking in the outback, you'll want to be sure to grab some of the exotic produce and treats found at the many markets in town. Another can't miss treat is the Aboriginal bush tucker. Used for tens of thousands of years by the natives, this bus tucker is a mixture of plants and animals used in a variety of ways to be sure to extract the best nutritional and medicinal values. Give it a try and see if it helps you tackle the outback better. Traveling around the Northern Territory can be a challenge, as it's so expansive. There are flights available through the region, and a consistently running train. The Ghan train runs from south to north with stops to major cities along the way. The most convenient and scenic way to experience the outback, however, is to drive through it. There are five themed drives to take on  the Explorer's Way, Savannah Way, Red Centre Way, Binns Track and Nature's Way. Each has their own story and adventure. If you are going to drive, know you won't miss much with 96% of the Northern Territory's accessible by sealed roads.